On December 16. 2010 RedGate released a free tool for DBAs for managing and and running T-SQL or IronPython scripts. 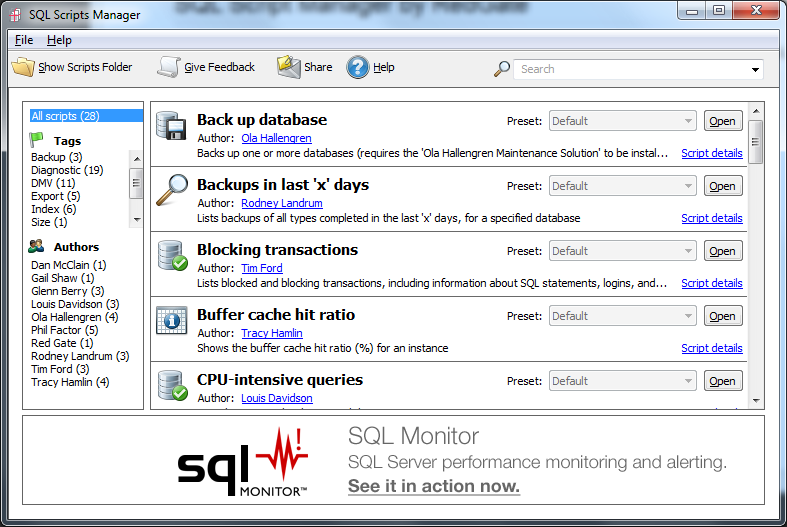 You can download the script manager directly from RedGate SQL Script Manager site. The script manager allows you to manage collects scripts, and simplify their execution using Presets. Scripts are organized by Tags and Authors. Script manager comes pre-bundled with 25 administration scripts and other scripts can be downloaded from SqlCentral.com scripts repository. User can even create it’s own scripts. The scripts are encapsulated inside the .rgtool file, which is an XML file which structure is described on the RedGate support pages for the SQL Script Manager. However it is interesting tool for collecting and managing scripts, I think, it brings nothing special what cannot be handled by the Templates and Templates Manager integrated in Management Studio (if talking about T-SQL Scripts). What more, SQL Management Studio Denali brings a new Code Snippets known from C# and VB .NET development in Visual Studio, which brings another power to the SSMS and from my point of view, writing the .rgtool is more complicated than writing a T-SQL template. On the other site it could be a useful tool for beginners DBAs.